I knew this was a turning point in our family. Our kids were starting to spread their wings and getting us all together or in the same state was going to become more difficult with the oldest preparing to move to Montana. Also, the realization set in that our next family portrait might be at one of their weddings! Hard to believe that we were now headed into a different stage of parenting young adults rather than children but here we were. You truly know what priceless really means when you know that there is not any amount of money that would make me want to part with my family portrait and this same portrait would not have any power or value if it was simply on a disk or hard drive and not on my wall. I’ve been blessed to have a career in providing portraits to our clients, often explaining the importance of having them taken and displayed in their homes. The ability to look at this every day and be reminded of those sacrifices to get us all to this moment is a priceless reminder to me of our families bond. 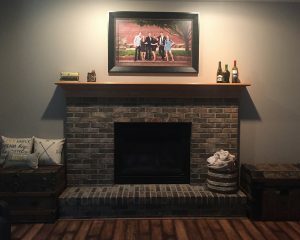 Now as I admire my own family portrait above my fireplace I’m reminded just how powerful a portrait can be. This article has been brought to you by Katrina Bishop.